Remember all that ‘I’m not a plastic bag’ furor and all the hoo-ha that ensued on the fakes market? In recent years though, fashion peeps other than Anya Hindmarch are all for the non-plastic bag, producing them at every given opportunity; shows, launches, fashion weeks, tradeshows etc to hand out for tote-lovers like me who likes to accumulate them and use them for heavy groceries, toiletries and magazine shopping with the latest one being the YSL AW08-9 Manifesto bag. Am I the only plonker who keeps them all scrunched up under the kitchen sink ready to haul out for the carrying in addition to the proper bag? Nope, I do it too- only I keep them under the sofa cushions so they stay flat! I tend to hang mine on the side of my mirror and use them to carry packages in when going to the Post Office! I do love a good tote but I sometime struggle with them because I carry so much stuff around with me that my tote becomes a black hole and I can’t find anything in it. I rather enjoy a bag full of pockets to keep my phone/keys/ipod etc in. it’s all well and good that we are using less and less of plastic bags but we are now indeed collecting some serious amount of cotton bags now… Less should be more but it seems like we are getting more of something else…. You have a lovely collection there, i really like the “fix my plumbing London’s coming” bag. They are all wonderful though, i can see why you keep them + it seems waist full to through them away! You’ve got a nice collection of non-plastic bags there! Haha. I’m all for non-plastic bags but seeing as how my family aren’t I’ve kind of taken a break from hounding them about it. I need to get back on it. Nope. You’re not the only one, I keep mine in the car. I also use the free bags you sometimes get from magazines. I try to avoid getting those because how useless are those tiny things anyway? I don’t know what kind of shopping is supposed to fit into those things. I tend to give them to friends who carry totes. I have saved one or two for days at the beach but that’s about it. not at all: i have a small collection that are perfect for all those unfashionable moments, such as stacking up on toilet roll and washing up liquid at the supermarket! so chic(!) ha ha. Mine are all under the sink to. I use them for what feels like daily trips to the supper market! I’d keep them all too, if I had them. I live in a high rise building with a trash chute and no other way to dispose of garbage unfortunately. I suppose I could line my garbage bin with brown paper bags. Totally get the bags under the sink thing…although in my defense, I do use them instead of swing bin liners! Rest of the time, i of course use my own range! They’re still the best ads we do! I keep mine folded up and tucked into a large bag, and the ones to be washed are stuffed under the kitchen sink! oooh, i had this one from a purchase i made from diesel in the mid 90’s sometime… i don’t know what happened to the item i got, but they included this canvas tote, which i used until it disintegrated a few months ago. i totally keep these bags, so handy! We’ve got quite a few totes hung up in the kitchen near the door so in theory we can grab one when we’re popping to the shops. Never happens though! Oasis sold some organic cotton totes that go into their own little pouches, which are great cause I can just leave them in my bag and I’m more likely to have them with me. I’ve used them for groceries for years. How uncool to do otherwise. Of course I’m glad you posted this Bubble. I’m a really naughty shopper and I’m hardly ever prepared with bags when I nip out, especially impromptu cake-buying sessions at the supermarket! I’m glad supermarkets are starting to make you pay for plastic bags now though as it will force me change my ways. I love the idea of having your totes ready under the sink and you have a lovely selection! I do exactly the same thing! I like them but so many people brag about their “green-ness” just because they use a canvas tote that was probably made with unsustainable materials buy a factory worker in China, and then the factory let the waste seep into a river or something, and remember the bag had to be flown in . . . I have nothing against these bags, I actually quite like them, but so many are faking their green credibility. Despite this, it is good that people are using them instead of plastic bags because at least these can be used over and over. Am i the only person that does not like them? I think they are a waste of space, And I need plastic bags for the garbage,but in alternative I have several of this supermarket eco bags because they are adapted and more resistant to carry groceries. i will definitely have a stroll in the center of Milan on saturday, hope to get my copy of the ysl bag. The YSL tote is being handed out at several locations in London…think vogue.co.uk has all the deets…. Ah confusion ahoy…I don’t use them for garbage…Una, for me they’re pretty strong for groceries unless I’m buying bulk bottles of water in which case I use a carrying device called a boyfriend…. Eelie: What a great idea…! I have many from fashion boutiques too…. check besmartbegreen.com bags too. adorable and on sale! I keep my canvas bags piled up in my closet, ready to be grabbed for grocery shopping, hauling books to the library or to carry stuff to the cleaners. Very useful. mine are under the sink too…but they are not ysl…maybe someday. I wish they were giving them away in boston. 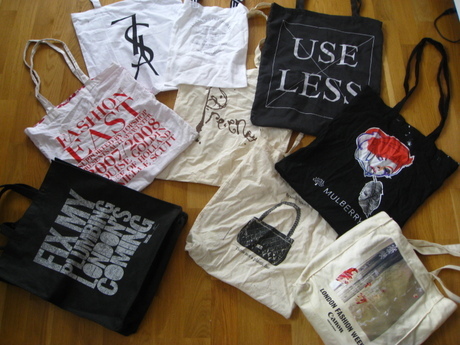 I always carry my own (mostly selfmade) totebags with me in my purse. If i shop for something, it like “No thank you, I have my own bag”. This way I keep my tote/plastic bag quantity to a minimum. hi! ive been a lurker in your blog. i find you amusing and i really love your style. my fave from your loot is the ysl tote. can i have it if you get tired of it? hehehe i live in cambodia so it’s quite nil for me to get one. it’s really cute with the upside down print.